One interesting feature of Firefox on Android is the web browser's reader mode. It is basically replicating functionality that extensions and bookmarklets such as Readability for Firefox, Readability Redux for Chrome or the Readability bookmarklet have offered for years: a way to improve how content is displayed in the browser. It works best for articles on the web. Most site elements, like the navigation, menus, advertisement or social media widgets, are removed in the process. The text itself is processed as well, a new font type and size may be used and the new page uses a color scheme that is light on the eyes and improves the readability of the article. Reader Mode worked more or less like that. If you are using Firefox on Android all you have to do is tap on the reader mode icon in the browser to process the active web page. 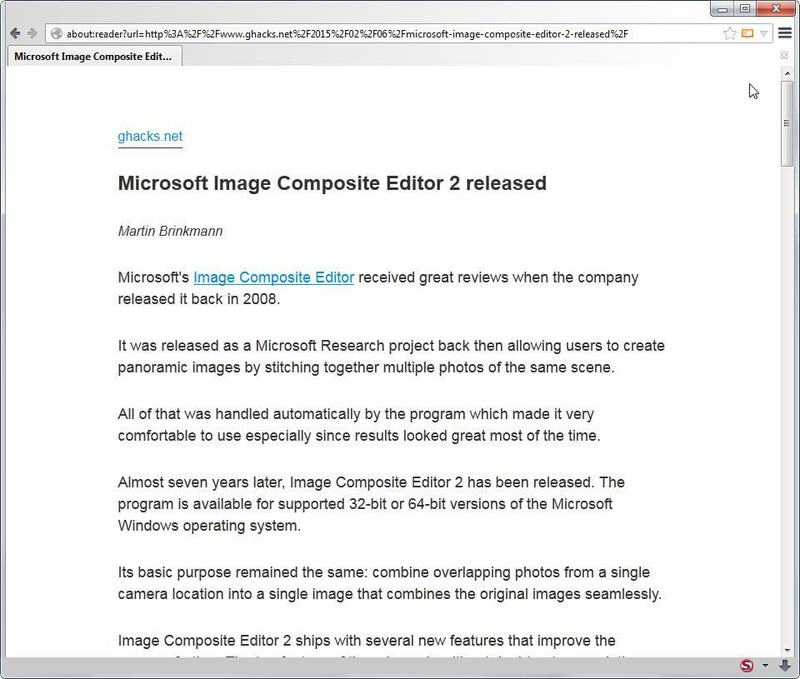 Reader Mode landed in the browser back in 2012 and Mozilla had plans to port it to the desktop in the months following the release. That did not happen until now though. Tonight, a first implementation of Reader Mode was added to Firefox Nightly. It is not enabled by default thoughand it is unclear when it will land in other versions of the browser. The preference reader.parse-on-load.enabled determines whether Reader Mode is enabled or not. Confirm you will be careful if the prompt comes up. Double-click the entry to set it to true. This enables the mode. You may need to restart the browser. When you visit a website after it is enabled, it is listed as an icon on the right end of the address bar. A click enables the feature on the web page you are on and modifies it to a Reader Mode version. This is an automatic process that happens in the background. The page that opens up is bare bones. It lists the article title and the article itself but all other elements that were part of the original web page are gone. Links and images are still included but when you navigate away from the page Reader Mode is not used to load the new page. The Android version of Reader Mode supports several configuration options that the desktop version does not ship with currently. It is not possible to click on an icon to change the theme on the page or modify font size and margins. Since it has just been added to Firefox 38 Nightly, it is possible that those features will be added in a future update. According to the Bugzilla listing, Reader Mode is currently not compatible with e10s. Mozilla has started to add Firefox for Android's Reader Mode to the desktop version of Firefox. There’s a plugin by Evernote which does exactly the same but is available for Firefox since years: Evernote Clearly. (https://evernote.com/clearly/). Nice. I’ve been waiting for Mozilla to port this feature back to the desktop version. Frankly, I don’t see much of a point for this myself. Maybe others use it though. I do. I read novel with this kind of mode. Some sites, when you need to zoom enough for the text to be comfortable to read, all of the text does not appear on screen, necessitating scrolling left to right to see all of it. Evernote is for those kind of sites, as it gives you the large print size and keeps all the text on screen. Having been using Evernote Clearly for half a year. Perfect compared with many other readability extensions. Have no intention in trying the FFX flavour. Clearly is so clear already. This is a major feature coming to Firefox in general, as I expect the reading list to be synced between FF Android and FF Desktop. Because if one key aspect is the readability, it goes along with another feature as much important as the first one IMHO, the synced reading list. All that without the need of any addon will be perfect (as I don’t want Evernote or Amazon or… to know what I’m reading. I’d rather trust Firefox for that). So glad I ran across this! The Reader Mode about:config mod works great on my laptop, much better than any of the readability add-ons. On issue, though. While in Reader Mode there is a thin vertical frame on the left with a few controls. No problem, except when I go to print. When I print the simplified page, that bar not only shows up in the printout, but it also blocks some of the text on the left. (Again, this is only when printing; the bar doesn’t obscure any text on-screen). I found that when printing I can work around the obscured text by scaling print to, say, 90%, although the bar still shows up on the printout. Is there any way to make the bar either disappear completely, OR print the area just to the right of the bar? While I can do the latter by just highlighting text and printing selection, the drawbacks of doing it that way are that (1) the printout then ignores my vertical margins, with text overlaying the footer; and (2) I can’t do a print preview for a selection, and thus might end up printing, say, a useless final page that has solely a copyright notice, etc. I have also tried the familiar PrintWhatYouLike bookmarklet to remove the bar on the left, but for some reason PWYL won’t work on a a Reader-Mode modified page. Any suggestions of a better workaround for printing from Reader Mode? Regardless, this is great info, especially since I have at least a rudimentary workaround for printing. There’s an about:config reader.toolbar.vertical pref, but it doesn’t seem to do anything, though I didn’t try rebooting. There’s an addon called Remove It Permanently that allows you to select and disappear individual page elements, you could rip it, print, and then “undo last rip” or “don’t rip this page” to avoid saving a permanent rule. For articles I want to save, I use reader view on Firefox on my Android tablet, save as pdf and then convert the pdf to djvu to store securely. (I don’t like pdf’s.) I have a djvu reader on my tablet. I love this feature because I am sick of all of the visual pollution web sites have these days. Tons and tons of Shockwave and java riddled garbage that slows everything down and is useless to me, the reader. Thank you so much for this. I wish i could enable it for ALL web pages permanently.